With ears and a tail. And a nicely placed smile. And saddlebag testicles. 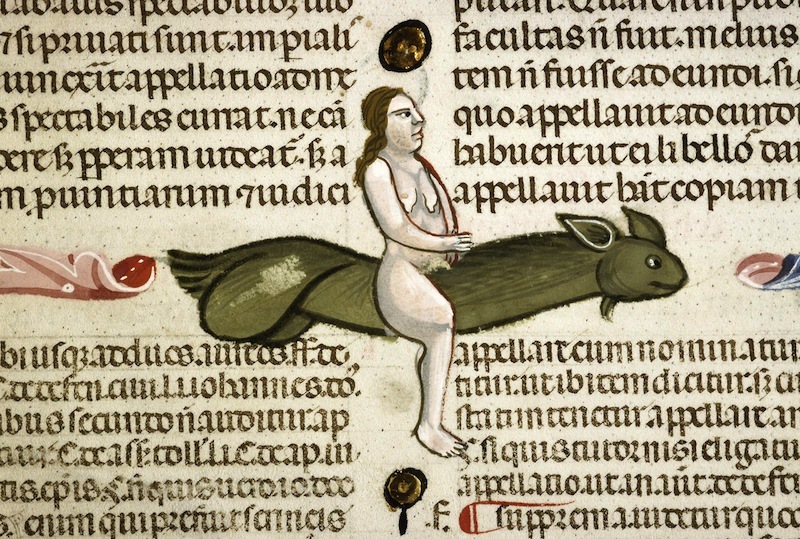 Decretum Gratiani with the commentary of Bartolomeo da Brescia, Italy 1340-1345. This entry was posted on May 23, 2013 at 2:25 pm and is filed under Gender and sexuality, Signs and symbols. You can follow any responses to this entry through the RSS 2.0 feed. You can leave a response, or trackback from your own site. I recently watched a PBS rerun of the 2004 series “Himalaya with Michael Palin.” In one episode, Michael visits a village in Bhutan where every building has a phallus painted on the outside walls to ward off evil spirits and for prosperity & protection. The guide tells of a story about the phallocentric Divine Madman, Drukpa Kunley. The Bhutan penises are also mentioned in one of the episodes of QI.